Optimism & Pessimism – Define “Reality” ? The article below tries to be objective. Does it succeed? Is reality real? What is your reality? This page is dedicated to the research why people are optimistic or pessimistic about certain things and how this is influenced by human nature, the media, or social changes.We are interested in this topic also because it is closely linked to our motivation for publishing Our World in Data. Living conditions around the world have improved in important ways; fewer people are dying of disease, conflict and famine; more of us are receiving a basic education; the world is becoming more democratic; we live longer and lead healthier lives. So why is that we – mostly in the developed world – often have a negative view on how the world has changed over the last decades and centuries? Why we are so pessimistic about our collective future? It is a peculiar empirical phenomenon that while people tend to be optimistic about their own future, they can at the same time be deeply pessimistic about the future of their nation or the world. Tali Sharot, associate professor of psychology at UCL, has popularised the idea of an innate optimism bias built into the human brain.1 That is, we tend to be optimistic rather than realistic when considering our individual future. 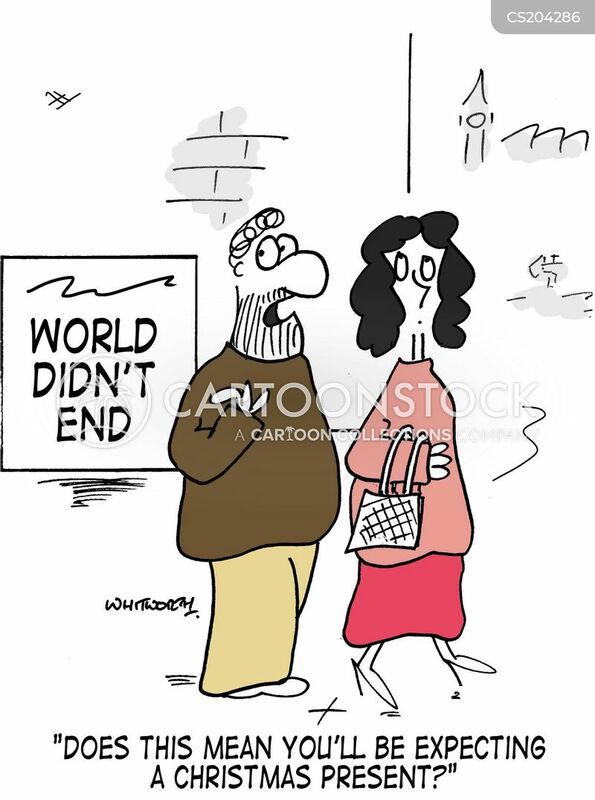 If you were to ask newlywed couples to estimate the probability they will divorce in the future, they would likely reject the possibility outright. Yet today roughly 40% of marriages in the UK end in divorce. Another example is asking smokers to estimate their chances of getting cancer and again, most would underestimate their risk. This optimism persists even when people are presented with the relevant statistics. Consider the following graphs from the European Union’s Eurobarometer surveys; they report people’s expectations about their own personal job situation and of the economic situation in their home country. From the end of 1995 to the middle of 2015, around 60% of people predict that their job situation will remain the same, while 20% expect their situation to improve. Compare that with the response of the same group of individuals considering the future of the economic situation in their home country. Although far less stable, the results show that most people expect the economic situation in their home country to get worse or stay the same. The expectation that things are going to worsen nationally is correlated with recessions, yet there is remarkable stability in the results for individual expectations. Does the response to the question about national economic well being better correspond to an individual’s true job prospects? This pattern is also observed on a larger scale. The first chart below shows how individuals in the UK respond to the question: “Thinking about …, how much of a problem do you think each of the following are in your local area and in the whole of the UK?” Individuals tend to believe problems are more pronounced nationally than in their local area. This chart shows how many individuals rate the environment in their local area as fairly or very bad, compared with the environment nationally and globally. Again, we observe a similar pattern for most countries. No matter where you ask people are much more negative about places that are far away – places which they know less from their own experience and more through the media. Why are we social pessimists? Individuals rarely think about grand issues such as the state of the nation or world, and so respond with an ‘on-the-spot’ answer that may not be well considered or even a true reflection of their beliefs. Responses to questions such as these (and more general questions about happiness or life satisfaction) are heavily influenced by ephemeral recent events. In psychology this is referred to as the ‘availability bias’. Another explanation put forward by Martin Seligman, professor of psychology at the University of Pennsylvania, suggests a link between control and optimism. If we feel more in control of our lives, we tend to be happier, healthier and more optimistic about the future. This could also help to explain the gap between individual and societal optimism: since we are in direct control of our own lives but not the destiny of the nation we feel more optimistic about ourselves. The psychological considerations before suggest that the lack of information is key to understanding why we are largely biased to think negatively about society and how things are changing. When we consider the degree to which the public’s perception can diverge from the reality we find unfortunately a lot of evidence that shows this empirically. The chart below shows the survey response to the question how global poverty has changed. 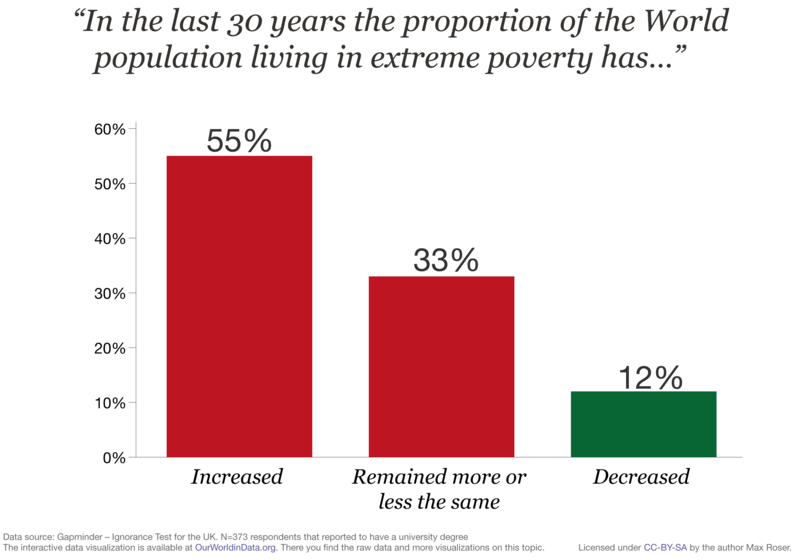 While the share of extremely poor people has fallen faster than ever before in history over the last 30 years the majority of people in the UK thinks that the opposite has happened and that poverty has increased! The chart presents the evidence from the survey in the UK and the ignorance of global development is even greater in other countries that were surveyed. The ignorance in the UK is particularly bad when one considers that the shown result is for the subsample of the UK population that has a university degree. See the Gapminder Ignorance Project for more evidence of this for global trends. The major flaw in much of the declinist narrative is the failure to distinguish between absolute and relative changes. Between 2010-14, US real GDP growth rates have fluctuated between 1.5-2.5% and yet, the US economy was recently overtaken by the Chinese economy measured in PPP-adjusted terms.9 In many ways this may capture the reason why the most developed nations tend to believe that their economy is in decline: relative decline is interpreted as absolute decline. Unsurprisingly, new EU member states tend to be much more optimistic about the future. The four largest economies — the UK, France, Germany and Italy — are the most pessimistic. This pattern persists when considering economies at different stages of development: developing countries are more optimistic about the future, while developed ones tend to be pessimistic. One interesting explanation for declinism is that it is the result of the way we encode memories and what we remember. Firstly, researchers have long established a robust pattern in the age at which we retain the most memories. In old age, memories from our lives are not evenly distributed but instead concentrated in two regions. These regions are (1) memories formed in adolescence and early adulthood, between the ages of 10-30, and (2) recent memory of events. The following figure is a useful representation of this distribution. In the light of this research on human nature it is then not surprising that one of the earliest Sumerian tablets discovered and deciphered by modern scholars was a complaint by a teacher about his students’ writing ability. There are three main reasons we should try to combat social pessimism and declinism. The first reason is simple; indicators of living standards are significantly improving around the world. By monitoring and researching these changes we can identify ways in which progress can be achieved. Over the long-run, say 50-100 years, human progress has been staggering with the benefits not confined to the richest or most powerful. The second reason is that if our perceptions of the reality are wrong, we can end up prioritising the wrong things and making ineffectual change. Finally, being optimistic can be good for your health, while having a pessimistic outlook can be detrimental to your health. The public perception of these indicators matters because it directly influences the priorities of voters in democratic countries and politicians. 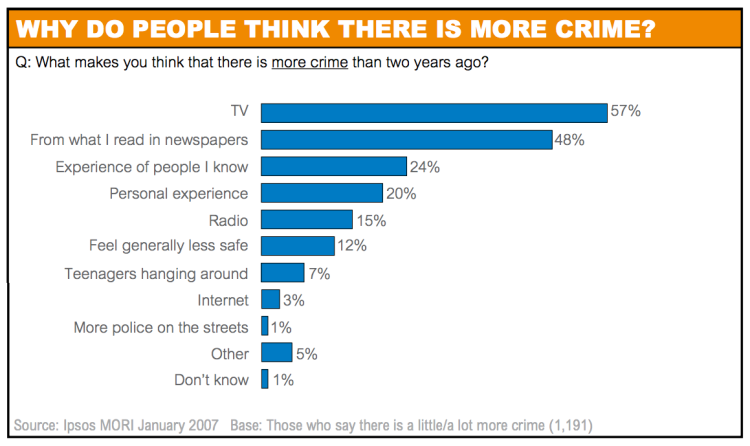 If, as in the example above, the public believes crime is increasing, it is likely that it demands more policing not for a reason grounded in reality, but for an imagined worsening of the society they live it. This is one reason why incorrect public perceptions can be a problem. The following figures underline just how sizable these effects can be. The first shows how spending on crime has moved with the public’s confidence in the government’s ability to crack down on crime. 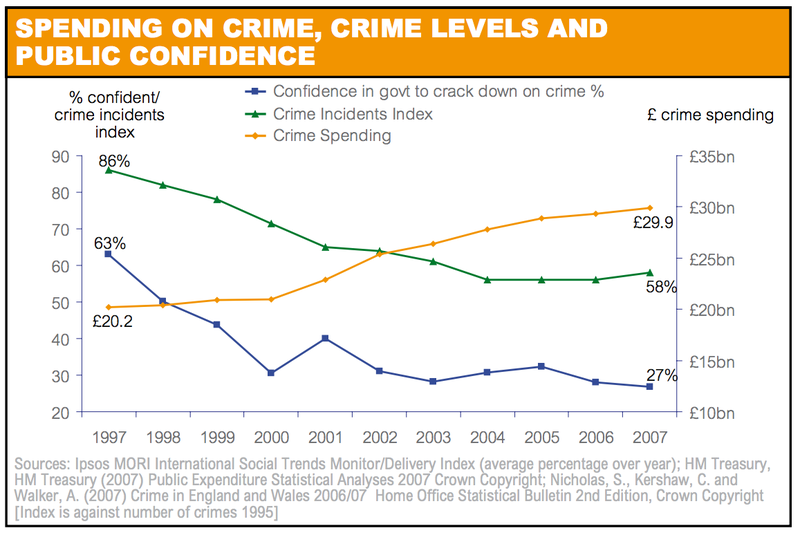 As the public’s confidence fell, spending on crime increased and recorded crime fell; without any uptick in the public’s confidence. One contributing factor to some of the widespread misinformation seems to be the content consumed through media channels. Of those who believed crime was increasing, more than half suggested that information on TV was a reason they believed there was more crime. In addition to this, almost half suggested that what they read in newspapers was a factor. Another dimension to this debate is the extent to which the perceived terrorism threat affects the willingness of individuals to trade-off civil liberties.17 Darren Davis and Brian Silver find that “the greater people’s sense of threat, the lower their support for civil liberties.” This effect is attenuated by the people’s trust in government but fairly consistent across nearly all political affiliations and demographics. With all the negative news stories and sensationalism that exists in the media it may be hard to believe things are improving. These events can be contextualised as short-term fluctuations in an otherwise positive global trend. Quantifying this progress and identifying its causes will help researchers develop successful strategies to combat the world’s problems. Below are just two examples that show important positive changes: A larger share of the world population is living a life free of poverty and more and more people live in democratic countries. More examples – on education, health, violence, hunger and many other important aspects – can be found throughout this publication. Further research using data from the Women’s Health Initiative found that over an eight year period, the most optimistic women had a 9% lower risk of developing coronary heart disease and a 14% lower risk of dying from any cause.21 Similar results were also found by researchers writing in the Archives of General Psychiatry; using data from the Netherlands, they found that the most optimistic individuals had a 55% reduced risk of all-cause mortality and a 23% reduced risk of cardiovascular death. Dire predictions for the future are nothing new. Indeed we can go back centuries or even millennia and find plenty of examples of pessimistic accounts of the future of the world. The infographic below shows a series of predictions for the year in which the world will end – from religious figures to scientists like John Napier and Isaac Newton. 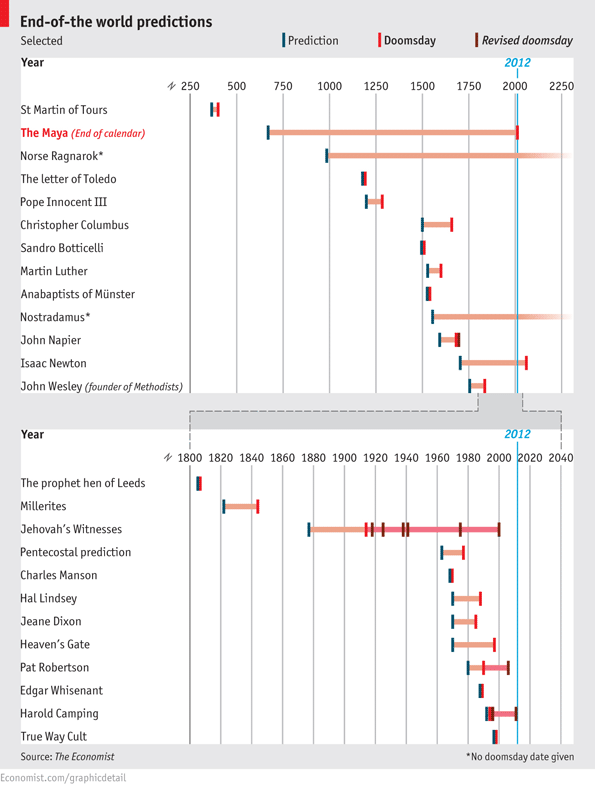 The beautiful visualisation below presents a time of predictions of the future as foretold in novels. Sharot, Tali. The Optimism Bias: A Tour of the Irrationally Positive Brain. New York: Pantheon Books, 2011.Sharot, Tali. The Science of Optimism Why We’re Hard-wired for Hope. New York: Ted Conferences, 2012. Eurobarometer surveys. Available online here. 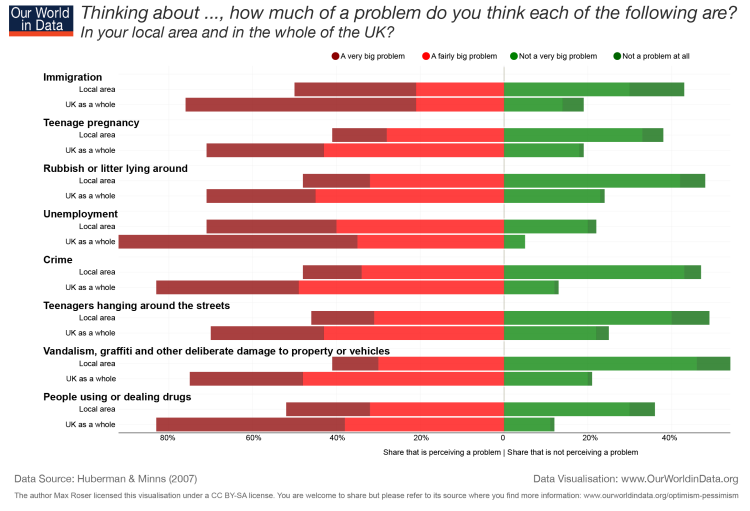 “Perils of Perception: Topline Results.” Ipsos MORI (2013). Available online here. Figure: Lomborg, Bjørn. “The Skeptical Environmentalist: Measuring the True State of the Planet.” (2001).Data: Dunlap, Riley E., George H. Gallup Jr, and Alec M. Gallup. “Of global concern: Results of the health of the planet survey.” Environment: Science and Policy for Sustainable Development 35, no. 9 (1993): 7-39. Available online here. Most Americans think teen pregnancy is getting worse. Most Americans are wrong. The Washington Post (2013). Available online here. The US is safer than ever — and Americans don’t have any idea. Vox (2015). Available online here. 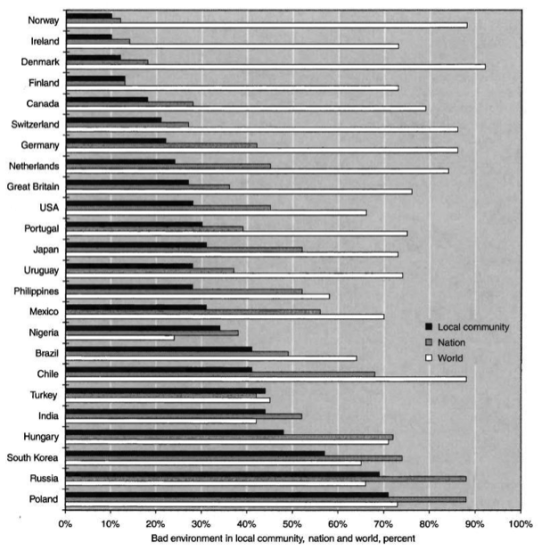 The data is taken from Hans Rosling (2013) – Highlights from Ignorance survey in the UK published at Gapminder.org. For more information on PPP-adjustments, please visit the economic growth page. Global Publics: Economic Conditions Are Bad. Pew Research Center (2015). Available online here. Reminiscence bump, Wikipedia.Journal references:Hyland, Diane T., and Adele M. Ackerman. “Reminiscence and autobiographical memory in the study of the personal past.” Journal of Gerontology 43, no. 2 (1988): P35-P39. Available online here.Jansari, Ashok, and Alan J. Parkin. 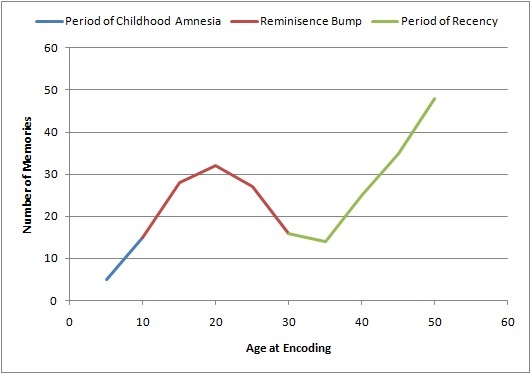 “Things that go bump in your life: Explaining the reminiscence bump in autobiographical memory.” Psychology and Aging 11, no. 1 (1996): 85. Available online here. Mara Mather, Laura L. Carstensen, Aging and motivated cognition: the positivity effect in attention and memory, Trends in Cognitive Sciences, Volume 9, Issue 10, October 2005, Pages 496-502, ISSN 1364-6613. Available online here. Daniels, Harvey. Famous last words: The American language crisis reconsidered. Southern Illinois University Press, 1983. Closing The Gaps: Crime and Public Perceptions. Ipsos MORI (2008). Available here. DellaVigna, Stefano, and Ethan Daniel Kaplan. “The Fox News Effect: Media Bias and Voting.” The Quarterly Journal of Economics 122, no. 3 (2007): 1187-1234. Available online here. Davis, Darren W., and Brian D. Silver. “Civil liberties vs. security: Public opinion in the context of the terrorist attacks on America.” American Journal of Political Science 48, no. 1 (2004): 28-46. Available online here. Boehm, Julia K., and Laura D. Kubzansky. “The heart’s content: the association between positive psychological well-being and cardiovascular health.” Psychological bulletin 138, no. 4 (2012): 655. Available online here. Positive feelings may help protect cardiovascular health. Harvard School of Public Health (2012). Available online here. Boehm, Julia K., Christopher Peterson, Mika Kivimaki, and Laura Kubzansky. “A prospective study of positive psychological well-being and coronary heart disease.” Health Psychology 30, no. 3 (2011): 259. Available online here. Tindle, Hilary A., Yue-Fang Chang, Lewis H. Kuller, JoAnn E. Manson, Jennifer G. Robinson, Milagros C. Rosal, Greg J. Siegle, and Karen A. Matthews. “Optimism, cynical hostility, and incident coronary heart disease and mortality in the Women’s Health Initiative.” Circulation 120, no. 8 (2009): 656-662. Available online here. “Doomsdays.” The Economist (2012). Available online here. This infographic is the work of Giorgia Lupi, and more of her work can be found at http://giorgialupi.com.